I’d been looking forward to seeing the Gauguin paintings ever since the Seattle Art Museum announced the exhibit last year. But I have to say I was disappointed. 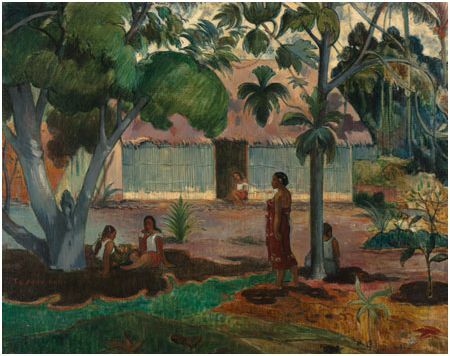 Too many of the works in this show were so drab chromatically, lacking the vibrant colors I associate with Gauguin’s works. The information about the artist’s life and time in the south Pacific was fascinating but many of the specific items in this exhibit just didn’t strike my fancy. Still, it was a nice way to spend a chilly February morning and I had delicious blueberry pancakes for lunch afterwards at the Fonte Cafe. It’s very early to be noting low scores, I know. But this morning I carded my personal best on the Twin Rivers course in Fall City. It’s a smallish accomplishment. Twin Rivers is a par 70 layout with a slope rating of just 109 from the blue tees. Still, in cool, damp weather with very mediocre greens I shot an 80, two lower than my previous best there. Since June of last year, my scoring average in 86.5 with fifty-seven of seventy-two rounds below 90 and twenty-five (35%) below 85. I’m going to challenge myself this year by playing a couple of harder courses each month to see if I can maintain that level of play.